QAnon drops are here. Refresh the page for the latest crumbs. This update was to be published yesterday but it was too cumbersome to deal with and I didn’t get far. I kept getting error messages and when Number One did his analysis of our comms he reported the ship was definitely running slow, with the number of attempted hack attacks almost doubled in the past 72 hours. He understood that as soon as Kavanaugh was confirmed the attacks across the web skyrocketed and a number of sites were affected. He is sourcing more dilithium crystals to increase our speed but my phone line cut out in the middle of a call with him and then my Internet was down briefly too, so I was a little frustrated. We’re supposed to have a tech working on the phone/Internet today. They work on it every week but it doesn’t get fixed. They can put bases on Mars but can’t give me a fast, reliable phone or web connection. Go figure. In the interim, because it’s been difficult working with the Starship Earth blog I posted at the Captain’s Blog instead. I published the newest War Drummer video there around dinner time yesterday and it has completely vanished. It’s not a draft, and it didn’t publish, so I’m including it below. It’s a must watch video about a Democracy and a Republic that puts things in a new perspective. I also shared a video last night of some additional, revealing footage during the SpaceX rocket launch on Sunday and that post on the Captain’s Blog is apparently off in hyperspace somewhere too. Why are there so often UFOs/UAPs around for these launches? There’s obviously more to it than they would like us to know, but “we know”. See that video below. I will continue to post at both blogs so we can cover the basic news. You can “follow” the Captain’s Blog from this link if you wish. Today the shields are up, and we’re doing much better so we will soldier on here at Starship Earth. Thank you Number One. You’ve earned some time on the holodeck. Due to the blatant, shameless censorship online, some folks have really serious issues. The Justinformed Talk channel made a video telling us that YouTube demonetized every one of his videos that they hadn’t already messed with in the past. Unfortunately, most of his videos are Q-related, making him a target. He is upset because he makes videos to support his family and doesn’t know what he’s going to do. Urgent matters like hurricanes are demanding our attention, too. 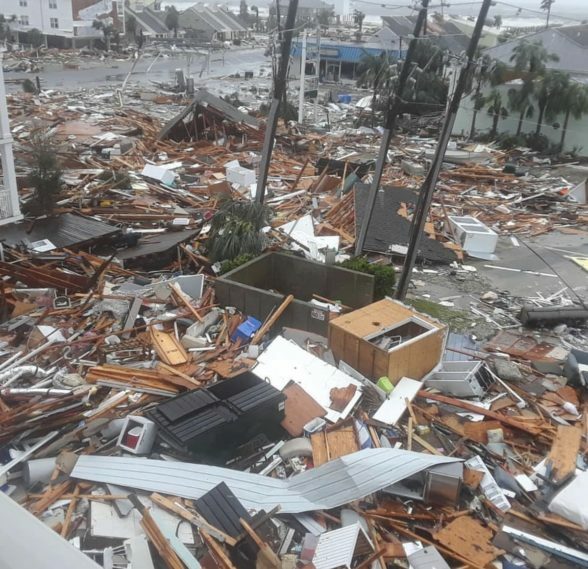 Michael hit the Florida coast as a massive Cat 4 storm and surprisingly moved inland still at a severe category 2 or 3, with more heavy rains and winds in Georgia and the Carolinas, unfortunately. It caused a tremendous amount of destruction and President Trump will be onsite to see for himself what needs to be done and get updates from the boots on the ground. See the details and photos here. Below you can learn why the New World Order uses these hurricanes to attack America every fall. It’s never just one reason. We are watching the financial situation closely as the old guard would love nothing more than to crash the system and make the President look bad and cause even more chaos, but since the message understood by the American people is that the economy is better than it’s ever been, it would be difficult to create a financial crisis just now, but if there’s a way to yank the rug out from under us the dark will make it happen. Dave brings us his usual credible and insightful X22 reports for October 10 about the financial, political and geopolitical situation, including his astute QAnon updates which resonate strongly with me. I think the incredible value in Dave’s reports lie in his ability to tell us not only what the cabal is planning, but how the situation appears to the public, and also what the patriots’ plan is and how it will actually unfold if all goes well. He gives us the good, the bad, and the ugly, leaving lots of room for hope and helps us remain calm. POWELL CRASHES TRUMP ECONOMIC BOOM! Raises Rates **AGAIN** on Trump — DOW DIVES 1,501 POINTS IN ONE WEEK! The War Drummer has done an outstanding job with this video. If you haven’t watched it, you may not understand Democrats and Republicans. I’m seeing it all with new eyes. Red is the colour of the October revolution in America, and red will be the colour of the El-ites’ eyes when we’re done with them. They will never stop crying. Check out the interesting wide-angle view of the SpaceX rocket launch. There was a lot going on if you zoomed out and panned a little. Mind Blowing “Secret Space Technology” During Space X Launch! If you think everything including the weather “just happens”, you may change your mind after reading this next article. Hurricanes and extreme weather have nothing to do with the imaginary “climate change” or “global warming”, although that’s what the media have programmed the masses to believe to cover their tracks. There are no accidents and everything on this planet with very few exceptions is planned and executed according to an agenda with nasty objectives. The ruling psychopaths are going down, and they know it. 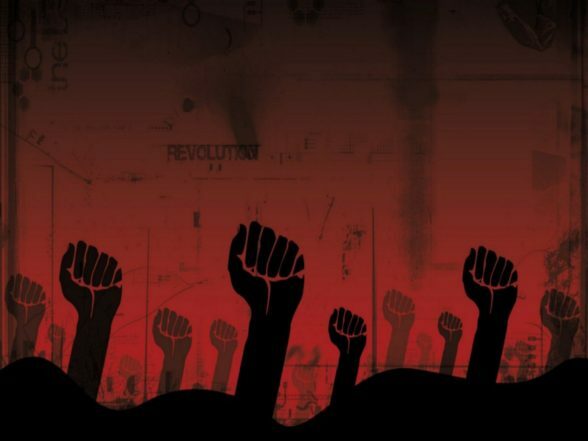 As a result they lash out with more furor than ever—and they will never give up until they are literally destroyed—as they have tried to destroy us. It’s truly a matter of us or them at this point. 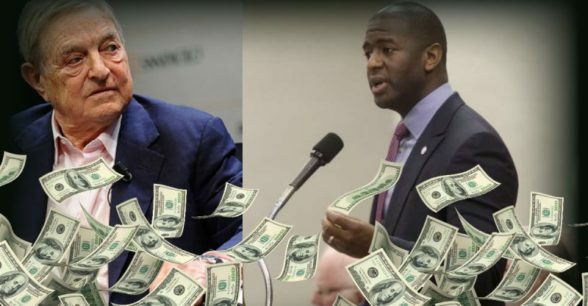 You may recall a month or so ago we mentioned the scheme to bring Tallahassee Mayor Andrew Gillum into the cabal controlled fold in Florida and it appears part of this was about that very goal. Don’t miss this brilliant article that will connect a lot of dots. Floridians must vote Republican! Hurricane Michael is only the most recent weather weapon launched by the globalist-controlled geoengineers at the U.S. coastline and heartland. There are multiple reasons why the globalists are directing this Cat. 4 Hurricane at the Florida Panhandle. First and foremost, this superstorm is being sent to Tallahassee, Florida the state capital. Not only will the state government be entirely preoccupied with the aftermath of the storm for many weeks going into the November 6th election, it will allow the desperate Democrats to rig the election under cover of chaos and destruction. The many counties that stretch across North Florida are as Republican RED as any other region in the 50 states. Hence, they have been targeted by the weather warriors just 4 weeks before Election Day, making it very difficult for voters to even make it to the polls, many of which will be blown away. Same for conservative South Georgia and Christian southern Alabama. Because the state government is headquartered in Tallahassee, the election machinery is controlled there, as is the process and procedure for certifying the election results. The ensuing hurricane mayhem will allow the Democrats to take advantage of the situation in ways that can only be conjectured at this point but we all know the DEMs “never let a crisis go to waste”. Make no mistake about it, the George Soros-funded candidate — Tallahassee Mayor Andrew Gillum — was chosen to win this year’s Democrat primary because he has been groomed to be Obama 2.0. He was also selected by his globalist masters to lead Florida leftward just as Obama did the nation. …and the George Soros-picked pawn will run the state into the ground just like Obama did to the country if elected. The key point here is that Hurricane Michael will give Gillum a second opportunity to get it right this time. The mayor has been out appearing for photo-ops filling sand bags this week when he should be doing much more important things, but then this whole ruse is being staged for political show. Yes, the globalists will do anything necessary to shoehorn Gillum into the Governor’s Mansion so desperate are they to win the 2020 POTUS election. The Democrat Deep State knows full well that whoever occupies the Florida governorship can determine the ultimate outcome of Florida’s highly coveted 29 electoral votes, the voters be damned. Both Texas and Florida have been the victims of much weather warfare over the past couple of decades. Texas is also a very red state and therefore frequently targeted with alternating droughts and deluges, both cataclysmic. Hurricane Harvey was only the latest superstorm geoengineered to paralyze a major hub for the Oil & gas Industry — Houston — among many other disastrous outcomes. See: Hurricane Harvey: A Geoengineered Superstorm Targets Texas—WHY? The numerous acts of weather terrorism perpetrated against the residents of Florida and Texas (as well as California) are all designed to advance the 3 major UN agendas. The following excerpt further explains the ongoing conspiracy to undermine American sovereignty and territorial integrity. The globalists who manufactured this oncoming calamity have a specific agenda that has multiple goals. Most of those relate to the UN agendas—Agenda 21, 2030 Agenda for Sustainable Development and Vision 2050. One major purpose is to move the affected populace away from the land and/or coastlines. Many of these regions have been identified as safe environmental corridors that are meant to be used exclusively by the power elite during the End Times. The spate of unprecedented mega-hurricanes that have been geoengineered over the past few decades are also the deceitful product of the Global Warming crowd. There’s no better advertisement for the Global Warming hoax than to destroy a few cities, states or coastlines every year which are then blamed on out-of-control climate change as evidenced by wacky weather (read unrelenting superstorms). In fact, the UN just produced a fictitious and hysterical report that makes a case for biospheric Armageddon if humanity does not turn down the heat (via carbon footprint reduction) post-haste. Of course, all the models used by the UN Intergovernmental Panel on Climate Change (IPCC) are based on CO2 generation produced by human activity, which completely ignores the influences of natural sun cycles. Project Veritas has a stunning new undercover video for us from their hidden camera interview series. They have exposed shocking miscreants within the establishment which lead to firings and demotions. Kudos to these determined, well-trained sleuths. They are playing an important part in the dismantling of the evil cabal. Douglas Ducote Jr. has this to say about the alarming and growing violence within the Democrat Party and how he sees it playing out in America if it continues. I couldn’t close off today without including this educational discussion between Thomas Paine/Douglas Gabriel and Michael McKibben. Just brilliant. We’re all using the Internet and technology now and we must understand how it works, who controls it, the plan for the world, and what must be done to secure our safety and our privacy. Thomas Williams will bring us the latest intel this afternoon/evening on the Truth, Honor & Integrity Show at 7:30 EDT, 4:30 Pacific if you’d care to tune in here or here. This entry was posted in Uncategorized and tagged agenda, ATF, banning ammo, cabal, California, censorship, civil war, climate change, democracy, Democrats, digital tyranny, Douglas Ducote, Douglas Gabriel, elite, end-run, Federal Reserve, financial crisis, Florida, geoengineering, George Soros, global warming, hoax, hurricanes, illuminati, Kavanaugh, launch, love, market crash, Mayor Andrew Gillum, Michael, Michael McKibben, nd amendment, new world order, obama, October 7, October Surprise, panhandle, Phil Bredesen, Project Veritas, psychopaths, QAnon, red, Republic, revolution, rocket, SpaceX, spell, spell of democracy, Starship Earth, stock market, superstorm, Thoma Williams, Tom Fitton, UAP, UFO, violence., vote, War Drummer, weather wars, website hacking, X22 report, YouTube. Bookmark the permalink.